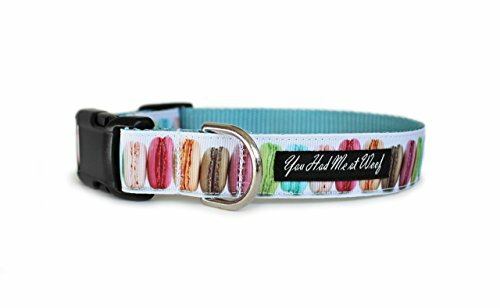 This macaroons dog collar is dedicated to the delectable dessert, which dates back to Italy in 1533. This dog collar is scuff resistant, made from high quality nylon webbing for durability, and features an adjustable slider for a custom fit. A portion of every purchase is donated to animal rescue organizations ♥ Available in sizes for small, medium, and big dogs. Size Reference: XS (5/8") 8"-11", S (3/4") 11" - 14", M (3/4") 13" - 18", S (1") 9" - 13", M (1") 11" - 17", L (1") 15" - 24", XL (1") 18" - 27"
If you have any questions about this product by You Had Me at Woof, contact us by completing and submitting the form below. If you are looking for a specif part number, please include it with your message.